Two Way Radio Blog – techwholesale.com » Lights! (Radio!) Camera! Action! Nothing hustles like shooting on location! From the trailers to the lighting truck, to make-up, wardrobe and props to the set, it’s a non-stop flow of people and STUFF. “We can’t be out of gaffers tape!” “Vinny was wearing the gold tie clip in the bar scene, right?” Her majesty wants more Perrier with lime. And when you need another 10 feet of cable: you need another ten feet of cable. Time to radio for help using a Motorola handheld radio! Because when it comes to the lines of communication between all the different departments that do, carrier pigeon ain’t gonna cut it. Film and television production is all about making things happen — Now! On screen, it’s magic. On location and on a budget, it must run like clockwork. Cut to a shot of the crew of Law and Order Criminal Intent in Manhattan using their Motorola two-way radios while filming the episode, “Icarus”, (May 9, 2011). Each person I asked said, “Every crew member uses one.” Every crew member includes folks from props, camera scenic, art direction, grips, electrical, set scenic, editors, unit management, sound, stunt coordination, wardrobe, hair and make-up, directors and probably the hardest working people in show business: the production assistants. Turning scripts into tape means all of these departments need to talk to one another. To make two-way radio communication work for your production company: assign each department its own dedicated channel/privacy code and issue every person on-set a list of pre-programmed channel and privacy code settings for every department. Walkie-talkies on a shoot means you keep rolling, saving time and money. You can further slim signal-to-noise by designating a special channel/privacy code for private conversations that don’t involve the larger groups. Duplicating radio settings across all units is easy using a cloning cable or multi-unit charger with cloning capabilities. Paul customizes his radio experience with accessories that accommodate his role on the set. He swears by his surveillance clip mic and earpiece, “I use my hands so much and I swear a lot, so I run the wires down the back. I hear better with the earpiece in my ear”. Some crew members, like wardrobe, keep it old school with their radios shoved in their bag or clipped to their belt for easy access. Others clip a speaker/mic to their shoulder like uniformed police officers on and off the show. Shoulder mics keep hands free and allow easy push-to-talk with a speaker right where it counts in the loud environment of the Manhattan streets — next to the ear. For editors and production assistants it’s the earbud clip mic , make-up prefers the headset boom mic, pretty much everyone tailors their accessory choices to their duties and wears ‘em like their favorite old sweatshirt. Techwholesale.com offers a diverse array of two-way radio accessories , so your crew can make choices that work for them. On the road, Dennis, a Teamster who drives one of the big rigs for Universal Networks LLC, says “All the transportation issues are routed through walkie-talkies.” Motorola radios help the Law and Order Criminal Intent convoy keep on trucking’ using push-to-talk communication to re-route around traffic snarls, know what to haul and when to stop for bathroom breaks and crispy creme. The transportation crew communicates on their own channel; so their chatter doesn’t distract the rest of the company, yet drivers are readily reached by anyone when needed. Frank Roth, personal driver and 10-year friend of actor Vincent “Vinny” D’Onofrio aka. ‘Detective Bobby Goren’, jokes that if it weren’t for their Motorolas, “We’d be hollering’ down the street, ‘Quiet on the set!’ with the old Rudy Valley megaphones.” He’s not kiddin’. The block at 8th street and 45th that day was alive with the sound of Push-to-Talk, as crew members shuffled production equipment between several different sets. “5 minutes for Mr. D’Onofrio!” Whether you’re working with big name talent hounded by star-struck groupies and gossip mongers or you just prefer confidential communication, Motorola business radios protect your privacy with features like channels and privacy codes or the virtually impenetrable Frequency Hopping Spread Spectrum (privacy features depend on the model you purchase). So which model should you buy? Well, that depends on your needs and your budget. The basics start with band. Exclusively outdoor operations should stick exclusively to the VHF band. VHF waves perform best over long distances outside. If you think you’ll be working indoors or a mix of in and out, UHF band or digital radios are hands down your best bets. If you’ve already got some UHF radios knocking around that you’d like to keep in service, then you’ll want to choose a compatible UHF radio. Digital radios took the market by storm a few years ago and have continued to gain popularity. Motorola DTR 410 and its big brother the DTR 550 offer the crystal clear quality and feature-rich usability of today’s digital technology without the budget drain of cell phone bills. Potential access to over 10 billion sub-channels with the digital’s Frequency Hopping Spread Spectrum means you won’t have to worry about the tabloid’s eavesdropping on your radio communications. Also, digital radios don’t require an FCC license! 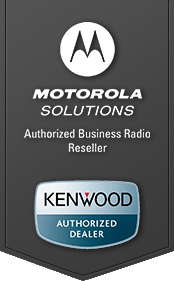 For more on power, range, available features and the ins and outs of choosing the best business radio for your film and television production company, check out Techwholesale.com’s comprehensive two-way radio guide . Clipped to a belt, shoved in a cluttered bag, hooked right on your shoulder – handheld or hands free – Motorola radios make communication among different departments on set smooth, easy and instant across broad distances over all kinds of terrain. Just Push to Talk! To see real life photos of the shoot check out the set on Techwholesale.com’s flickr page!